Geocaching – High-tech treasure hunting | Post Falls On The Go! There are thousands of geo-cache sites located throughout the Post Falls community. What is Geocaching and who does it? Geocaching is one of the world’s fastest growing live, recreational social media treasure seeking games. Using your smart phone or a GPS mobile device, you can locate hidden containers, called “caches”, in the great outdoors. Geocachers are families with children, retired individuals and grandparents, hikers, explorers, and outdoors-people. If you’re resourceful … nothing! The great part of geo-caching is it has very little, if no expense, and your family is getting great exercise while having tons of fun searching for treasures. Go to www.geocaching.com and register for FREE. If you take something from the cache, leave something of equal or greater value. How do I find the coordinates for the cache sites? 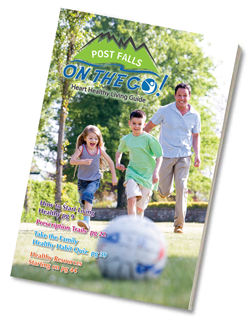 Once you set up your user name and password at geocache.com , click on the SEEK tab and enter the zip code for Post Falls (83854) and a map will pop up with all of the sites in our community. Latitude lines run east and west and tell you how far you are north or south from the equator. Longitude lines run north-south and tell you how far East or West you are of the Prime Meridian. The Prime Meridian is the line of longitude that runs through Greenwich, England (near London). Traditional Cache: This is the original geocache type consisting of, at minimum, a container and a log book or logsheet. Larger containers generally include items for trade. “Nano” or “micro” caches are tiny containers that only hold a log sheet. The coordinates listed on the traditional cache page provide the geocache’s exact location. Multi-Cache (Offset Cache): A Multi-Cache (“multiple”) involves two or more locations. The final location is a physical container. There are many variations, but most Multi-Caches have a hint to find the second cache, and the second cache has a hint to the third, and so on. An offset cache (where you go to a location and get hints to the actual cache) is considered to be a Multi-Cache. Mystery or Puzzle Caches: The “catch-all” of all cache types, this form of geocache may involve complicated puzzles that you will first need to solve to determine the coordinates. Mystery/Puzzle Caches often become the staging ground for new and unique geocaches that do not fit in another category. Navigation – GPS receiver, smart phone or old fashion compass and map. Keep an open mind! Tip: Some people are very creative with hiding their cache so read the description and clues and most of all THINK! Respect the outdoors! Be cautious in public places (“muggles” might be watching you). Replace the cache as you found it. If you take an item from the cache you must add a different item (so bring a few “treasures” to share) and keep it fun for everyone!